This George Kovacs monorail light kit offers flexible track that can be curved and shaped into position. Complete rail lighting system by George Kovacs includes everything you need to install a custom system. Hand-bendable low voltage rail system allows for a straight run or a flexible, curved design. Lights can be positioned anywhere along the rail. A great look for kitchen lighting. Brushed nickel finish with white glass shades. Comes complete with ten feet of flexible monorail, one surface-mounted 150 watt electronic transformer, four standoff ceiling connectors, endcaps and line connectors. 10' wide monorail. Extends 5 7/8" high from ceiling to track. Includes five 20 watt MR16 bulbs. Flexible five-light monorail track light kit by George Kovacs. Brushed nickel finish over metal construction. White glass shades. Four standoff ceiling connectors, endcaps, line connectors. A surface-mounted 150 watt electronic transformer. If I wanted to replace the provided bulbs with dimmable LED bulbs and use a compatible LED dimmer, would this fixture support the dimming? BEST ANSWER: Yes, these are Halogen MR-16 bulbs. You can replace them with an LED equivalent and use a dimmer. can we just order the rail? BEST ANSWER: Hi, to order replacement parts please contact our parts department. is it extendable to a longer length? BEST ANSWER: Hi, yes the monorail can be extended. To order parts please contact one of our lighting specialists. Can the monorail be shortened? BEST ANSWER: Hi - yes, the lengths of the track can be cut. can it be mounted om the sloped ceiling? BEST ANSWER: No, this is not recommended to be installed on a slope ceiling. I see you said transformer is in center ...can it be offset?? BEST ANSWER: The transformer is designed to mount to a junction box and can connect to the rail at any point. Is the transformer fixed or can it be moved to the end of the unit? BEST ANSWER: The transformer can be mounted to any point of the rail. It does need to mount to the junction box for power so the rail need to adjust around it. it is centered you say but can it be offset to the end of unit? BEST ANSWER: Yes, you could add 2 more track heads to this fixture. The transformer is rated for 150 watt and each track head uses 20 watts. However, if you replaced the bulbs with LED bulbs you could add a few more track heads. Please contact one of our lighting specialists via phone, email, or chat. They can assist you in ordering more track heads and selecting the best LED bulbs for this fixture. I assume these are halogen? Can you replace with LED equivalent and use a dimmer? Has anyone tried this? BEST ANSWER: Yes, these are Halogen MR-16 bulbs. You can replace them with an LED equivalent and use a dimmer. Click on the images below for replacement LED bulbs and compatible dimmers. The monorail is compatible with LED and is dimmable using an ELV dimmer (Electronic low voltage dimmer). how can i get replacement glass shades for the lights? BEST ANSWER: We can indeed order a replacement glass shade for this unit. Below I have included the style number for the glass. Since it is a special order item we will need for you to call in and place the order. I installed this fixture in my kitchen as a primary light source. it is great, it looks great and provides good lighting. I installed it with a dimmer and it works out just fine. the installation was a bit tricky. the base itself was very simple to install, but the anchors for the supports that hold up the track were a bit of a pain. I have very old plaster ceilings and the anchors were not strong enough to bore thru the plaster. I had to drill a hole in the plaster before installing the anchor. but other than that, i really didn't have any problem installing the fixture and the individual light units. 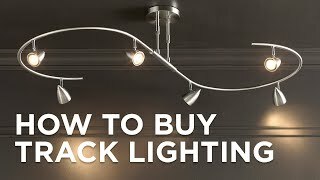 If you are tired of the classic can shaped track lighting and want a little bit more than the light bulbs hanging on a wire this is a great fixture. The track was easy to install. You can custom bend the track to what ever shape you want. It is a durable heavy duty track that doesn't get bent easily. Also to make changes to the lights there is a lever that you can use while the light is on. With can lights they are too hot to do this. I would recommend this for those going for a modern approach to track lighting without being totally minimalistic. Overall it is a great fixture for the price. We used 2 5-head rail lights in the living room for wonderful ambient and accent lighting. We used an 8-head rail light in the dining room which provided the best illumination for dining and also extra heads for accent lighting. They are beautiful additions to our contemporary home.